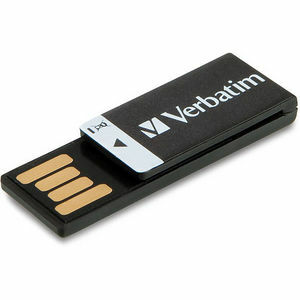 Verbatim's award-winning Clip-it USB drive offers first-of-its-kind functionality and practical data storage. Designed by Arman Emami, the Clip-it USB drive combines the speed and simplicity of flash storage, with the usability of a paperclip. This practical solution for daily business and private use offers compatibility with all USB ports. Designed to be resistant to dust, water and static discharges, the Clip-it USB drive is available in a range of vibrant colors.